So many of you ask me what I use on a daily basis and I promise that post is coming soon...but one product that I can not live without is Vitamin C serum. It tightens your skin, helps lighten hormonal pigmentation (I was one of those that was cursed with horrible pregnancy melasma) and helps ward off wrinkles. I lather it on every SINGLE night before I go to bed. The only problem with Vitmain C serum is that it's one of the priciest skin care products on the market. I currently use this product and I have also used this one (yikes expensive I know). But today I am going to show you how you can make your own...for under $10! Get excited people. A dark colored glass bottle. I used an empty serum bottle. Vitamin C powder (L ascorbic powder). You can find this at your local health food store that carries products in bulk or you can purchase here. %100 pure vegetable glycerine, which is a great base for serums and makes your skin extra glowy and soft. In a small bowl mix 1 tsp of Vitamin C powder with 2 tsp of vegetable glycerine. Carefully pour your serum into your glass bottle. Apply 3-4 drops onto freshly cleansed skin and gently massage in until fully absorbed. * Update- if you are having trouble getting the crystals to dissolve, add a tiny bit of purified or distilled water to the mixture. This should completely solve the gritty problem some of you are experiencing. SO easy and you skin will thank you for this I promise. My recommendation is to use this only at night to start. If you think your skin can handle more go ahead and use twice a day. Since this serum is all natural and does not contain any preservatives, only make enough to last you about two weeks. Vitamin C serum may cause temporary redness and that is normal, but if you have any burning sensation remove with cool water and lower the ratio of Vitamin C powder to vegetable glycerine. Enjoy and please come back and let me know how you like this if you try it out! I dont always get a chance to comment...but I love love love your skin care tips!!!!!! Jamie- Since I have never used camu camu powder I can not give you an honest opinion but you are more than welcome to play around with ingredients to see what works for you. I have a question, will this cause any skin lightening? I am looking for something to naturally lighten one part of my face. Thanks so much Lindsay for that great tip!!! My skin breaks out almost anytime I try something new - do you think this would be okay for someone with oily/acne prone skin? Anonymous- Vitamin C has an natural brightening effect so yes, this can help lighten discolored areas of the skin. I love all of your beauty tips! I can't wait to try this! I tried a vitamin c serum once and I felt like I had a sunburn for days. My skin was red, tight, and sore to touch. 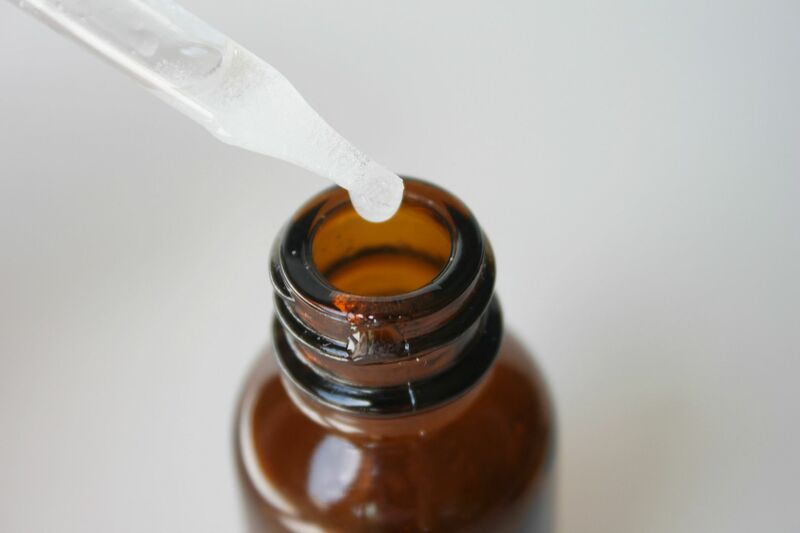 Do you think a homemade serum would be more or less potent for sensitive skin? I never thought of making my own! Thanks for sharing. I've made this serum before (using ascorbic acid), and it really helps even out your skin tone. If you have sensitive skin, add less ascorbic powder. I got it! !wonderful tips and I am gonna follow all the tips. This is great! Probably a rookie question, but do you put this on before moisturizer or after? Stephanie- my suggestion would be to do a patch test on your jawline for at least a week to see how your skin handles it. This formula is pure Vitmain C so it is pretty potent. oh yes i need to make me some of this concoction for my skin, thanks for sharing lindsay! Thanks for the recipe, excited to try it out. Question though, did you use this when you were pregnant? I love your skin care tips! Thanks! I feel like one lucky girl that I just stumbled upon this site. I just had my first facial and was told that the dark splotchiness on one of my cheekbones was probably hormonal pigmentation. Of course they wanted to sell me a half an ounce bottle of vitamin C serum for $53. Yikes! I will be making this homemade serum this weekend. Thanks for the post! Trying this today!! 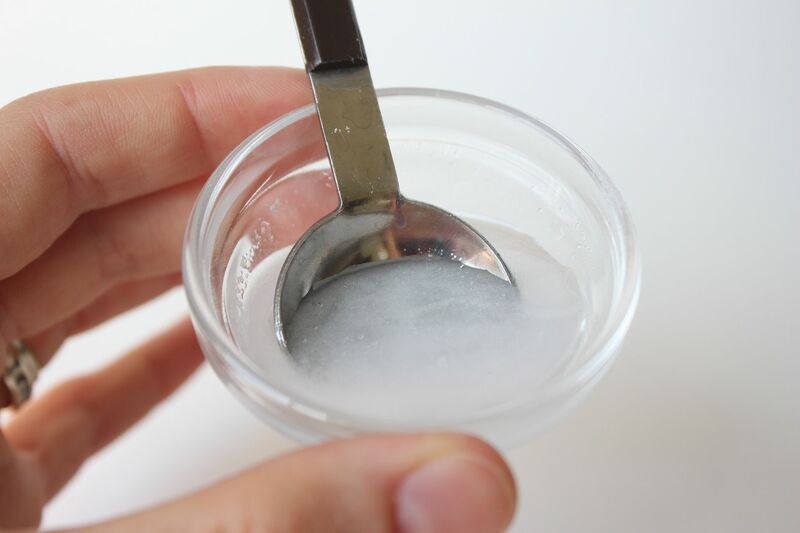 You are a life saver :) Do you know of any DIY everyday facial cleansers? I made this today super excited to try it, but I am having a heck of a time getting the crystals to dissolve. I crush and crush and it just stays grainy. It also separates after sitting for a few minutes. Any suggestions? I'm having the same problem as Rebecca! I used to use the Skinceuticals line that contained AHA and loved the difference it made but at that time got all their products for free, now I can't afford their prices. Never thought of making my own but will definitely try and will look for some alpha hydroxy acid to mix in. Thank you so much for posting. We're going to make this very shortly! Thanks! my daughter left for US from India for further studies. she has been complaining about acne n its marks left behind.worried more so bec. winter is setting in n she is getting more tanned. also dandruff problem. any solution for this. tks babli. My sister and I tried making this, however we have had difficulty getting the crystals to dissolve. We bought our Vit C powder from Vitamin Cottage. We put some on our face and it was very grainy. Is there a specific brand we should try? Also if we tried heating the product in the microwave would it destroy the benefits of the serum? I currently use a product with ester c, alpha lipoic acid, and dmae. For the last 3 yrs I have wanted to make my own and would like to use it all over. What I use now is too expensive to do that. Any thoughts or ideas? They would be greatly appreciated! But I'm still on board with this! I just made a small batch and had issues with getting the crystals to dissolve. Anyone here who was successful in making a good batch, how long did you stir it for. I stirred for about ten or minutes, then added a coupe of drops of lavender oil into it and stirred some more. My best friend just had a baby last night and I'm making this batch for her to clear up all the spots she got when she was pregnant. I suppose I could stir for a lot longer but I Have to go to the hospital now and deliver it!! I currently use a serum with vit c ester, ala, and dmae. Its actually for eyes but I use it on my whole face. I would love to make my own to use all over. Why do you buy one to use if you can make your own? Just wondering if the effect is the same. I just made this and I also had a difficult time getting the vitamins C powder to dissolve. I tried microwaving it and that made it super runny. So now I have it sitting in the fridge to see if it will get back to a gel-like consistency. Ok update to my above post, if you microwave this formula and then refridgerate it for just a couple of minutes, it will gel back up again. I microwaved and refridgerated it twice and it is a lot less grainier now, but not completely smooth. Lindsey, can you tell us how to crush the crystals? I'm having trouble too. Sorry some of you are having trouble with getting the crystals to dissolve. My suggestion would be to add a tiny bit of distilled water (this will help them dissolve a little) and use a magic bullet or blender to really get everything blended. Hope that helps! Ms. Lindsay, I'm having difficulty in finding vegetable glycerine here in my country is it okay to use pure glycerine instead? I am 53 and i have dark pigmentation on my face. I would really love to try your serum. Thank you. - DO NOT MICROWAVE or expose to any kind of HEAT. Vitamin C is highly sensitive to heat - loses its power. - Use a dark container like the one shown above and keep away from the light and heat. ths for this great idea! I made this, it turned out too gritty, but I did liked the results on my skin, the whole day my skin had a nice glow and tone, loved it! Unfortunately, I tried some lime juice on my face and obtained better results, I had the same glow and tone on my skin the whole day and I didn't get the greasy feel from the glycerin. Sadly, I found this out after I spent money on the vitamin c powder and the glycerin. PLEASE reply... I cannot get any information on this anywhere, and I am excited to try this but I have a very limited budget! Can I use regular vitamin C tablets ground and dissolved? Also can I use regular glycerine in my pharmacy? is that not vegetarian? Thank you for this Lindsey! Quick question: Am I buying the right vitamin C? Ingredients acerola extract non GMO? And to add! :) My mixture is an amber, brown mixture...not white. Do you not you like the homemade vitamin c serum? I noticed you listed your brand, have you tried the homemade? My mom and I love it? Just wondering which was better, homemade or the one you use. My skin doesn't like glycerine as a leave on, so I make mine with just rose water and Vitamin C powder. It's more like a toner this way and not a serum, but it works beautifully for my skin. The point is to get the Vitamin C into your skin. A very common recipe calls for 1/2 glycerin and 1/2 distilled water for the carrier, although you can go all glycerin (like this one), or all distilled or rose water. If you use a mixture, add the Vitamin C powder to the water alone first. It's water soluble, so will dissolve in the water much easier. Then add the glycerin and it will mix up well and it won't be grainy. After reading this post, I have all the ingrediants...except the serum bottle...does the serum bottle have to be dark colored? Why does it have to be? I've made this twice now. First time with grinding the powder in my blendtec blender. I recently bought a pestle & mortar so I used the vit C powder that I blended and used the mortar. Still grainy. I like the idea of using a but of distilled water. That will probably help. @totoang I believe the colored bottle is to keep light away from the serum. I have castor oil in my bottle so the batch I made this morning went into a little container from The Container store. I'm gonna stop by Sprouts today to get another. Can I do this with VIT E instead? I tend to get red dry from VIT C. If so, what would be the benefits, etc? Thanks! How would this be for a teen with CHRONIC acne on back, chest, face??? Anyone have the problem with separation? Once I made and put in bottle - all the vitamin c is at bottom and oil on top. And can't really get both with dropper!? I did just as described And used exact ingredients? Any help or suggestions? Thank you - so love your blog!!! Anonymous- I would not recommend this for cystic acne. It might irritate it. I have worked extensively with cystic acne in the past and I know that each person responds differently to treatments. My best advice would be to make an appointment with an esthetician or dermatologist so they can "see" exactly what is going on and give you a better idea on what you can do to help heal the acne lesions. i just paid $75 for a small bottle - thanks for this post!! & i agree - it's very effective. forgot to add - my serum - that i purchased from the woman who does my eyebrows - had some orange oil or essence in it - next time i'll check the health food store for some. You MUST have a cream with vitamin A in it if you are looking to bring the elasticity back to your skin, making it look and feel smooth. You also need Hyaluronic acid. Why? As we age, our body produces less and less of this important acid, affecting how moisture is stored in our skin. I use Lady Soma's Renewal Serum because it has both those ingredients in 1 serum, and its been getting me the results I have been looking for. I need to state that Vitamin C is available in several forms and some work better than others. They include L-ascorbic acid, vitamin C ester, ascorbyl palmitate, sodium ascorbyl phosphate and magnesium ascorbyl phosphate. All forms, but especially L-ascorbic acid, are highly sensitive to degradation upon exposure to light and oxygen. Magnesium Ascorbyl Phosphate tends to have more stability than L-ascorbic acid. Topical vitamin C ester can deliver powerful antioxidant properties and helps build collagen fibers. And research has shown that both ascorbyl palmitate and ascorbyl glucoside can also benefit the skin. However, ascorbyl palmitate is thought to be less effective for collagen synthesis. I use Devita 17% C-serum, which contain both Magnesium Ascorbyl Phosphate and L-ascorbic acid. It comes in a pump bottle, so it is not exposed to the air every time I use it. Although it's a dark glass bottle, I place it in my drawer so it is not exposed to light. i used this formula to dissolve the crystals easily. Powder + water + glycerine. For those of you who aren't super experienced in the DIY realm and having problems mixing, try simply adding the powdered vitamin C to a facial product you already use, like toner or lotion. If mixing with water, use DISTILLED or purified water- tap water has minerals, chlorine etc that reacts to the C and it makes it STINK! It MUST be pure, pharmaceutical grade powdered vitamin C with no other ingredients, not pills, or it won't work! You can buy a bottle of L ascorbic acid from amazon.com- I have "Now" brand "Vitamin C crystals" I like to add mine to "Thayers" natural alcohol free toner, and to my favorite "Derma E" Vitamin A gel for a super boost of all the best anti-aging minerals. Mix small amounts at a time- vitamin C is ONLY GOOD when FRESH, and NOT exposed to light or heat! Store your products in a DARK, cool place like a medicine cabinet. You can mix small amounts and put in a clean reused brown glass dropper bottle, or buy a serum/lotion dispenser from "DIY Cosmetics" online. do you HAVE to use vegetable glycerin? or can you use coconut oil? i use coconut oil for everything! and i wonder how it would work if you just get some vitamin c tablets and grind them up? I have a similar recipe. You mix rose water or distilled water with the vitamin C, then add the glycerine. Hopes this helps. I made this serum tonight but I cannot get it smooth - it is very gritty as I cannot get the ascorbic acid to completely dissolve. Do you have any tips? My Whole Foods store sells the little dark bottles, just an FYI for those in the States near a Whole Foods. My Whole Foods grocery store carries the dark serum bottles for under $3. Just a suggestion for those in the States near a Whole Foods. And thanks for recommending the Rose Water in a previous comment. I'm gonna try making it with Rose Water, instead of glycerin too - THANKS! I just made some serum, and I forgot to grind the powder so mine was gritty too. I just put it in microwave for a few seconds, and it wasn't so gritty! As for acne, tea tree oil is great for that! Spot treat it or mix with carrier oil, coconut works great! My teenager got the double whammy from both parents with the acne. And tea tree works, even on cysts. Hope that helps! I just wish I had that when I was a teenager! You have to add water to this recipe, otherwise it's just going to stay gritty. 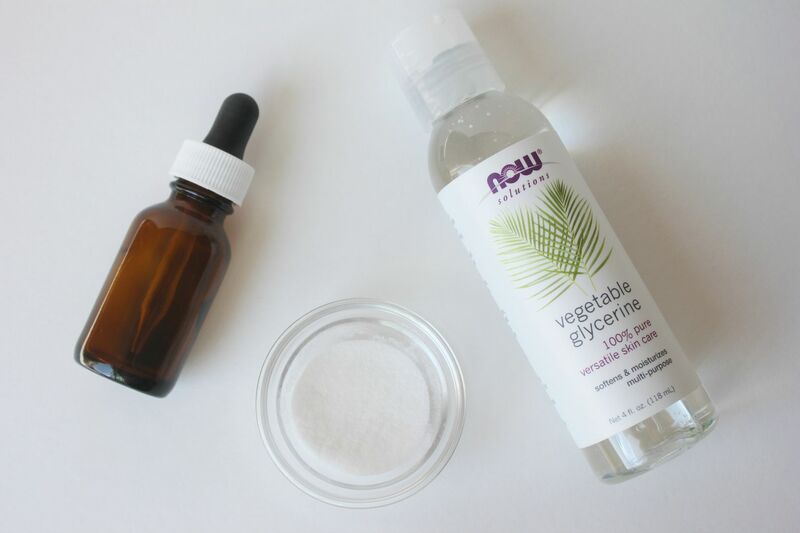 I've been mixing lotions and potions my whole life, and vegetable glycerin is probably my favorite, go-to ingredient and I love the idea of the ascorbic acid powder to create a Vitamin C serum but there's no way it will dissolve in any way the powder. But, I started with bottled spring water and kept adding the Vitamin C powder until the water reached it's saturation point and would not dissolve any more of the powder. Then, once I had this clear solution, I added in the glycerin, probably about a 50/50 mix. You can experiment. It works great! I gave my 30 something daughter a bottle of it and she is raving about how bright looking and baby soft her skin has become in the last week of using it!!! And she has really sensitive skin and has a hard time finding products that don't irritate and cause breakouts, etc. Another reason to add water is that the glycerin is just too darn sticky on it's own. This is a great idea, though, one I had never thought of. I love it!!!! I would add some lavender essential oil to this mixture. what if you dissolved the c in a small amount of natural witch hazel? I definitely would like to try this. I see some people have a problem with crushing the crystals..would it help to maybe use a mortar & pestal to do this? What do you use to crush the crystals? For those of you who are having trouble getting the crystals to dissolve, please see updated directions above. I wonder if using a coffee bean grinder would help make it less grainy. It grinds my coffee beans into a really fine powder, I wonder if it would do the same to C powder, making it easier to dissolve. Do you know what the concentration of the serum is? A concentration of 15%-20% of L ascorbic acid is recommended. I put my vit. c into a blender first and blend it into a fine powder. I do a whole jar at a time and it lasts forever. Lemon juice will lighten dark spots. I just made some of this and I too couldn't get the powder to dissolve enough to make a smooth paste... but it feels really good! If my skin can tolerate it i'll just scrub it in every night. I keep licking my lips too- hope I don't go too far and lick it from around my mouth because I need it there! I have Palmer's cocoa butter for stretch marks for the rest of my body. Anybody use that here? What do you think of this stuff? I really need help because I've just started using a month's supply of raspberry ketone pills and my skin isn't 'tight' to start with so goodness knows how I'll look after this. If I hold the weight down for a few years perhaps my skin will adjust? Then I can find a way to fill out a little? I am trying to buy this powder and they are saying that ascorbic acid is synthetic form and NOT good to use. We should get ORGANIC powder which is $25 for 120grams ... at health food store. I am trying to lighten the blemishes... you think its worth giving this a try? Does Glycerin - 100% vegetable based makes ur skin darker? Also - i got this vitamin C powder and when i MIX it it turn BROWN in color. love this blog as always. I have heard L Ascorbic Acid is very unstable and looses potency easily once exposed to light. Anyone have any comments on how long this lasted? I bought l ascorbic acid powder online . I just take a pinch on this powder on my palm and mixture it with couple drops of tap water and mix it together , I then pat this on my skin . This is a most easiest way to use ur own serum and u don't have to worry if its been deoxidized. Or u can mix 1 table soon of l ascorbic acid with 4 table soon of water mix it well and keep this in a dark container and keep n in the fridge. U can use it for a week or so. For those who do t know which product to use to make own vitamin c serum you néed L ascorbic acid powder , u can't not use vitamin c tablet and grind it and mix it in water , this is not the right way . So u can buy this L ascorbic acid online in eBay or amazon . All you need to do is mix it in water until. It completly dissolve and kee in a dark container . You have to make this serum every three to four days to get a fresh product . Since it the glycerin doesn't seem to be the major ingredient but merely a carrier, do you think fractionated coconut oil would be good? I have that one on hand and would love to make with what I already have. You need not worry about a preservative as the glycerin IS a preservatives. Anyone making herbal tinctures often use glycerin instead of alcohol or vinegar to preserve and extract the properties of the herbs. Are you sticking with your purchased product, or is this good enough for you to go with this mixture completely? I got the Vit C powder (hope Solaray is okay) and Now Foods vegetable glycerine (BTW, glycerine works as an amazing body moisturizer booster when added in equal parts to moisturizer...never had such seriously soft silky skin, application lasts for like 6 or so hours). Thanks so much for the easy and effective serum recipe! Soooo much cheaper than Peter Thomas Roth Camu Camu serum, which I love but costs a lot lot. Trying DIY serum NOW!!! Can I buy the Vitamin C that are in tablets? I'll just crush it. L-Ascorbic acid/Vitamin C online and it did not come in a dark package. The powder came in a clear plastic bag. Does the light degrade the powder? Or is it only important to keep out of sunlight in a dark jar AFTER it is mixed with the other ingredients? Also, I was going to mix with Hyaluronic acid instead of glycerine. Any thoughts or comments? Thanks! Hi there, Can someone tell me what the % of this DIY Vitamin C is? Is it 10%, 15% or 20%? i cant seem to find the L-ascorbic acid. can i just use the regular ascorbic acid instead. Do you know if you can use this around the eyes? Does it help with crows feet? Very good that you did not made it in tablets, tablets are bad! Every supplement and vitamin should be in liquid form! I have been using DIY Vitamin C for several years...you really need to add some distilled water to the mix to get the grainy out! Use Half distilled water and half glycerine or Aloe. It really needs the water to dissolve well. Vitamin C is also fantastic when you mix with vitamin E.
I love the Lady Soma Renew Serum. I use it in the morning before putting on my make up and I feel it gives my face a nice finish and helps my make-up to last longer. I also apply it at night. It has a wonderful feel when you apply it to your face and it absorbs nicely - with no sticky or dry feeling. I have not noticed any negative effects on the condition of my skin, such as causing blemishes or redness. I generally have normal skin so don't usually have much of a problem anyway. I highly recommend Lady Soma to 40 something women who are looking to combat those visible signs of aging that don't require more drastic or heavier measures to fight. THE VITAMIN C FOUNDATION SELLS L-ABSORBIC C POWDER WHICH IS NON-GMO, NOT MADE FROM CORN, IS HYPOALLERGENIC AND NOT MADE IN CHINA. BOUGHT ONE A CONTAINER WITH 1 GRAM FOR $30 SOMETHING. When applying the serum should I avoid the delicate skin around the eyes? I could definitely say that glycerine can give you the softness of your skin that you have been dreaming of. I loved it when I started using it. You need to get a life and RELAX. So what if there is a lot of confusion in a single thread over how to DIY vitamin C serum. Yay, congrats to you, you've been making the serum for 5 years...who cares. The rest of us are just trying to get the recipe and the concentrations correct. So...CALM DOWN! And I seriously doubt your 57 year old self looks 15 years younger. Have a great day now :)!!! I am not getting rid of the "gritty" texture....maybe not mixing long enough? And my mixture separates. Another poster mention she mixes with distilled water 1st.....then adds the glycerin? Anyone else have gritty mixture? I saw this post and tried a few of the above options. This is what works for me: At night, I mix approx.1 teaspoon of the Vitamin C with 1/8 cup water till disolved. It ends up looking like cloudy water, not a paste. I make it up once a week and just leave it in a cup in my bathroom. I just apply it to my face with my fingers. (I don't bother with the glycerin anymore). I then apply 1/2 pump of Hyaluronic Acid Serum from Reviva. This plumps up my skin. Since I've been doing this combination, I've gotten more compliments about my face than my entire life. I'm 52 with fair skin and I've been in the sun a lot. My friends are now all doing it with similar results. I hope this helps. wonder if heating in the microwave might help dissolve the crystals? I'm not keen on adding water. do NOT microwave or heat in anyway. you will ruin your vitamin c.
Add DISTILLED (NOT tap) water, MIX, and then the glycerin. glycerin will also extend the life of your formula but it is difficult to get the crystals to dissolve in just glycerin. you can use NOW brand super vitamin c crystals. it's a good cheap option or there's another l-absorbic acid powder in a white jar on amazon that's about $8 for I think 1.8oz. you shouldn't have a texture problem with thar vitamin c.
this mixture should between transluscent to white. vitamin c serum does not last long at all. it will start to turn yellowish. you should throw it out and make a new one then. this will need to be done about every week so don't make too much at once. it's worth mentioning this mixture is a little on the strong side at 33% (the formula is one third vitamin c) . a lot of people like to start at 15 or 10, but some even 5. adjust to what you can tolerate. addressing the inquiries about adding other ingredients, I don't have an answer for each of them but my question is why? we're making vitamin c serum, not a vitamin c moisturizer. if you want to go ahead and put moisturizing ingredients on your skin then do it! why you want to mix it in the serum I don't understand. just apply your preferred moisturizer afterwards. Love this post & all the other skin care tips on your blog - Ive been pinning like crazy! Could you tell me where I could get a dark glass bottle as such to store it in? Also do I store this in the fridge or in my cabinet? Can you do anything to prevent skin discoloration during pregnancy or after pregnancy ? Skin pigmentation changes usually disappear on their own after delivery . You can remove your fade skin easy way .Use stria fade that contain vitamin E and alpha hydroxy acids .Get instant solution in short time. Thank you anonymous from September 19. You are right there is too much confusion about the serum. It is actually very simple and my tip is - just keep it simple. Mix with water or glycerine or both. Don't add oils, instead use a moisturizer afterward and preferably wait a couple of minutes before applying your moisturizer on top. Vit C works better that way. Thanks again! And to the poster who posted the mean reply right after that post: I want to say I think Anonymous September 19 has been helpful and patiently explaining to all and you have added nothing to this post but negativity. I have a quick question. I have rosemary and lavender essential oils, could they be added to the serum in small quantities? I've heard that using a small amount of almond milk is great to make a paste, any ideas on this? I don't particularly love glycerin, could this be mixed with another oil. I typically have emu, coconut, almond, avocado,grapefruit seed, jojoba, apricot, rosehip and vit e oil on hand, do u think one of those would work? Hiiii!!!! Can we apply it on under eyes!? And can it help to do disappear dark circles!!!! I've tried DIY but the DIY for me didn't last too long. It also got crusty really fast. I'll stick to my regular vitamin c serum as it doesn't do that and it gets rid of my wrinkles and age spots pretty fast. Would you commend May Lindstrom's Youth Dew as night time oil? What sunblock do you use? I love this serum. I have used the Obagi c serum and this is just as good if not better. It has eliminated many fine lines and softened some around eyes and mouth. Since it is so affordable I put on chest, hands, and arms where age can show. I have eliminated many other expensive products with this. Love the DIY tips. I do heat the distilled water and add to c to dissolve then add the glycerin. Love the microwave tip. Glad I found this site. I love Vitamin C. This DIY serum will go great with my routine. I'm using Clarity Vitamin C Serum by Eu Natural (find it on Amazon) every other day and a DIY serum on the other days. My friends have been noticing my great skin!! Also when making my own vit c serum with hydraulic acid what's the best way to merge these two ingredients? Sounds interesting but what about the fact that Vit C serum has to be in a pump bottle so that air doesn't destroy it's benefits? Apparently Vit C breaks down when it hits air. And the Ph has to be lower than 3.5 to penetrate the skin. Every product I find that has ^ is very expensive unfortunately and you only get 1 ounce! The pharmaceutical grade is premium. I'm waiting for a company to realize they can sell more bottles at a reduced price. Not many women can afford $80-100 and up for 1 ounce of Vit C serum. Ok so I need this to last long term! I am sick of making this and having it go bad in 2 weeks :( What preservative can I use to make this have a shelf life?????? I have searched everywhere and can't find anything! I don't want to keep spending $50 on the store bought stuff when I know I can make my own but just don't know what preservative to use! HELP!!! I bought a 100 % pure glycerin usp in the pharmacy, is this considered a vegetable glycerin? IF it irritates ou could try sodium ascorbate instead - it's vitamin C but in non-acidic form. Could you use coconut oil instead of glycerine? I use coconut oil on my face anyway, and that would make life easier. Thanks. Hi will the vitamin c serum help crows feet fine lines n strengthen elasticity of your skin? I love this C serum. I've been trying to add Vitamin E to it as well but can't figure out a way to cause the oil to emulsify with rosewater (I know oil and water don't mix, it's just frustrating as so many DIY C + E serums online mention adding E and there is no mention of how to get it to blend and no one seems to have a problem with this). So far I wasted the first bottle trying to add a few drops to the dissolved C rosewater, then finally mixing the Vit E oil to the glycerin before mixing it with the dissolved C rosewater. Neither works very well since the Vit E starts to separate and stick to the dropper- go figure- even when I give it a really good shake. The other problem I have is trying to increase the pH of the serum since I keep hitting a pH 2! Other than that, it's been helping a lot with my post mole removal scars (pH 2- 2.5 or not I'm using it!) and I have a really glowy face when I wake up in the mornings. It's too soon to tell if any of my freckles have lightened. Ascorbic Acid is synthetic Vitamin C...be careful with this, it is a known carcinogen in high does and it is very difficult to locate real organic Vitamin C extract aside from fresh fruit. Is there another carrier oil I can use other than glycerine? Wow, people make a lot of dumb comments. I've made this off and on for years using a jar of vitamin C crystals my husband bought by mistake long ago (he thought they were tablets). I mix a dab of crystals with aloe vera juice (either from a jar or my plants), let the crystals dissolve a little, then paste it on my face at night---but not every night, since it's very acidic. The crystals dissolve the gelatin of the aloe, interestingly. They don't totally dissolve. No problem. They might if you let them sit for a bit. If you are using a C serum made with Glycerin in the day, make sure to use a physical sunscreen (titanium or zinc), since the glycerin with not allow a chemical sunscreen to penetrate the skin. Does glycerin darken the skin on regular application on skin. I have a sensitive skin. Concern is only referring with the glycerin while making the Vitamin C serum. Hey Lindsay, I just enjoyed reading your DIY mix of Vitamin C Serum. How do you suggest to add Vitamin E and hyaluronic acid/collagen, as they go well with Vitamin C serum for a radiant, glowing, wrinkle free skin. Hi Lindsay, Should you avoid using this serum on and around eye areas or is it safe to use it on those parts? You can order L ascorbic ULTRAFINE acid from Lotioncrafters.com. They are the only company who I know of that sells the ultrafine. You can still grind up regular in a small nutri bullet, but why bother??? Hi Lindsay, I've never thought about using Vitamin C as skin lightener on pregnancy melasma. It seems to be a good and useful idea. I will share this information with my readers. Thank you. dissolve in water. Hence all the above comments. I myself dissolve the crystals in water and then add glycerin. Thanks for this, My face will appreciate it greatly! Hey Lindsay, I found your writing interesting and educating. Thanks a lot for such an article. However;To the best of knowledge, Vitamin C serum is much competable with E. What is opinion on addition of Vitamin E and hyaluronic acid/collagen? Wow! I really love your post.I even i tried at my home and was really happy with your tips. I have read another post regarding adding of Hyaluronic Acid to get wrinkle free and radiant skin. Is it preferable to add it along with the vitamin C serum? Lindsay, I love Vitamin C serum. I have bought some from Amazon. I am looking for some recipes what i can do myself at home. I will be really happy if you share some more c serum recipes with us.